You are here: Home / Recipes / What’s for dinner? What’s for dinner, you ask? I hear MamaKat is starving. Frankly, so am I. I kind of lost my cooking/sharing of recipes motivation a few weeks ago. Thank goodness the kids really don’t care what I cook and CandyMan is never home for dinner anyway, so I really don’t need to worry about cooking. Wait. Maybe that’s WHY I’m having a problem staying motivated to cook. My friend Mariana’s Sweet and Sour Chicken. Yum! (I’m hoping that maybe, just maybe, typing this out will inspire me to actually make something decent for dinner tonight!)….. Wash and pat dry chicken pieces. Sprinkle with garlic powder. Dip in beaten egg, then in flour to coat. Brown in margarine in a saute pan. Place in baking dish. Combine all other ingredients and pour over chicken. Bake at 350 degrees for 1 hour, turning once. This can also be cooked in the crock pot. Just add the chicken and sauce to the crock pot and cook on low for about 6-8 hours. Omit the turning. FYI–I am not as happy with boneless skinless chicken in this recipe. Sorry, MamaKat, this is definitely not gluten free. Want to win it? This time, it’s easy. Just leave me a comment. Tell me what you are having for dinner if you’d like. Help me get out of my grilled cheese and spaghetti funk (don’t worry–I don’t eat them together). ~click the fish link on my left sidebar or take the Fishful Thinking resilience quiz. Really, any of my standard extra entries are fine. I’m easy to please. This giveaway will end in one week, on April 30, at 10:00 PM Eastern time, and winner will be contacted via email (so make sure you leave one for me). Good luck, my friends! 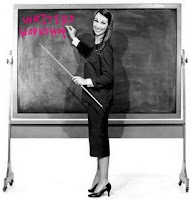 OK–that was a very non-traditional writer’s workshop, but I DID answer one of the prompts. Hehe! Go see what everyone else is writing about today….